"Is this is the Lost Village?" The little blue guys are back… again. Sony has debuted the first teaser trailer for the new Smurfs movie titled Smurfs: The Lost Village. After two mediocre live-action hybrid movies starring Hank Azaria and Neil Patrick Harris, the studio has decided to reboot and try a fully-CG-animated movie. 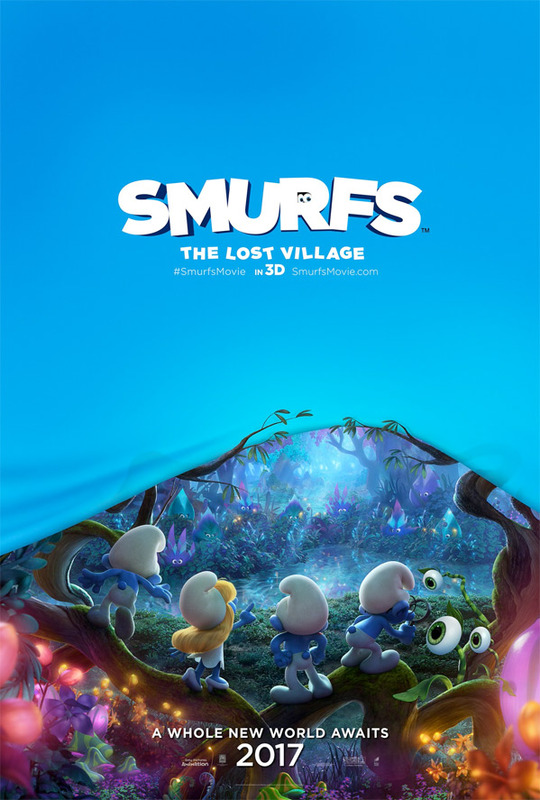 Smurfs: The Lost Village features the voices of Mandy Patinkin as Papa Smurf, Rainn Wilson as Gargamel, Joe Manganiello as Hefty, Demi Lovato as Smurfette, Jack McBrayer as Clumsy, Danny Pudi as Brainy. As indicated by the title, this new adventure takes them to a long lost village where they are said to discover "the biggest secret in Smurf history." What a pitch. This teaser is mostly a re-introduction. A mysterious map sets Smurfette and her best friends Brainy, Clumsy and Hefty on an exciting and thrilling race through the Forbidden Forest filled with magical creatures to find a mysterious lost village before the evil wizard Gargamel does. Embarking on a rollercoaster journey full of action and danger, the Smurfs are on a course that leads to the discovery of the biggest secret in Smurf history! Smurfs: The Lost Village is directed by animation filmmaker Kelly Asbury, of Gnomeo & Juliet, Shrek 2 and Spirit: Stallion of the Cimarron previously. The screenplay is written by Stacey Harman, based on the characters created by Peyo. Other writers include Karey Kirkpatrick, Chris Poche, Pamela Ribon, Jay Scherick. Sony will release Smurfs: The Lost Village in theaters in 3D starting April 7th, 2017 next spring, just before the summer. Mixing real characters with CG characters was a bad idea indeed. It worked with Who framed Roger Rabbit, because it was a witty comedy. Another bad sequel that no one wanted and will perform just good enough to warrant another terrible, unwanted sequel. At this point I'm pretty sure Sony is just mocking at the audience.